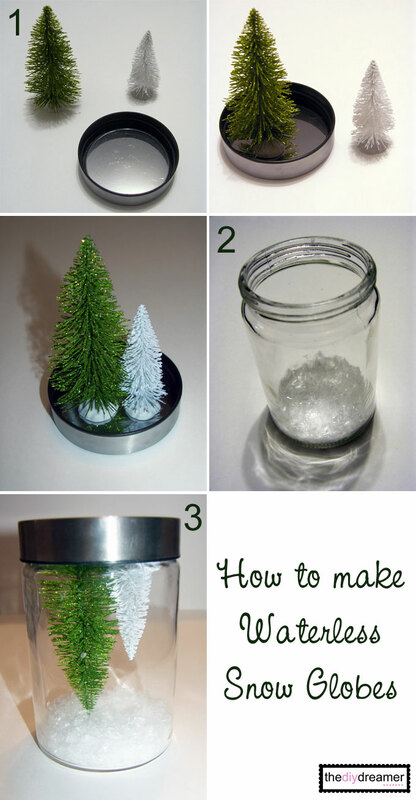 Two weeks ago I visited See Vanessa Craft with a Waterless Snow Globes Tutorial for the 20 Crafty Days of Christmas. I just love how the Waterless Snow Globes turned out, that I figured I should show them off here too. Enjoy the tutorial my friends. With Christmas and winter approaching I can’t help but think about the snow that will be arriving in no time at all. My daughters LOVE snow globes, they each own a couple of them. The only problem with snow globes is that they are heavy to carry because of the water. My girls love to carry them around to play with them but each time I’m worried they will drop them because of their weight. Since they love them so much, I decided that we would make waterless snow globes together. They will be able to carry them around as they wish. We had so much fun creating our waterless snow globes. It’s such a quick and inexpensive project. 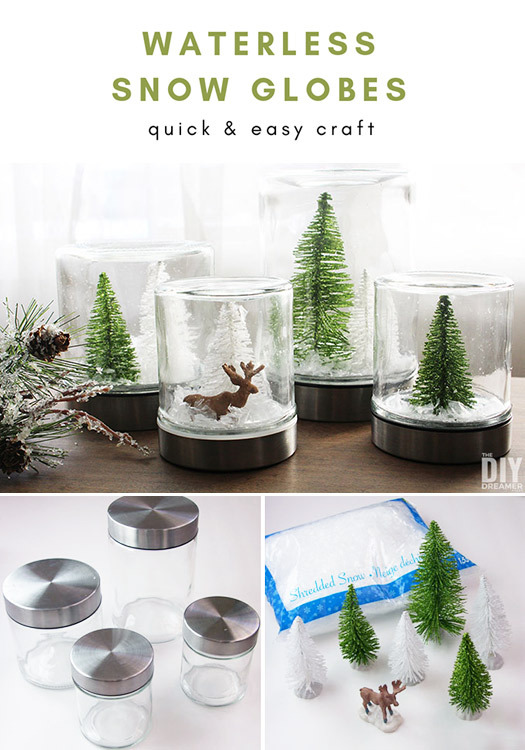 Step 1: Take off the lids from your containers and hot glue your decorations onto the lid. Make sure you do not place your decorations too close to the sides otherwise you won’t be able to twist the lid back onto the container (it happened to Emanuelle’s snow globe and we had to pull off the moose.. which caused us to break its legs in the process.. thank goodness for superglue hehe). 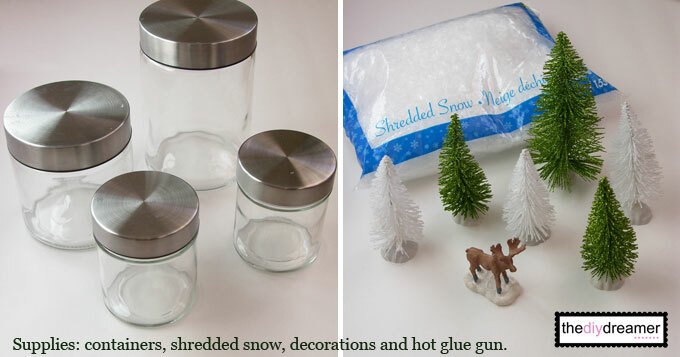 Step 2: Pour some shredded snow inside the containers, as much or as little as you want. Step 3: Twist the lid back onto the container. Now you can flip it over and enjoy your waterless snow globe!! Easy enough right? My girls LOVE them, they have been having fun moving them around as they please. We are probably going to make some more too! They are just so fun to make! Previous Post: « Wooden Glitter Reindeer!!! They’re awesome! I think I’m gonna steal the idea! these are beautiful!! I love how they look without water! Thank you so much for linking up to Handmade Tuesdays @ Ladybug Blessings! We love snow globes in our house. These are beautiful! Thanks for sharing today. Hi Christine, those are so lovely! I have to do them some day, easy to do, when it’s without the destillered water :-) thank you for the inspiration, you are awsome! Those are so sweet I love them and I love that they don’t have water in them. these are definitely on my list of projects to do! I love these! They look so simple but so gorgeous! I love the entire set up! I love these and want to make some! What are those trees called and where did you get them? Thank you. These are awesome! I plan on making these with my kiddos over their break. Thank you so much for sharing. Absolutely sweet! Sharing at the party tonight~ thanks for linking up at Feathered Nest Friday! Love this idea, you are so creative!! Thanks so much for sharing them at Artsy Corner! These are so pretty Christine and you got some amazing pix!!! Thanks so much for linking up at last week’s Humble Brag. This week, The Better Half, along with a bunch of other awesome bloggers are hosting a link party to support the Sandy Hook area – $1 will be donated for every project linked up. Its up and running now. Hope to see you there! Last week’s features will be posted Friday morning along with the ad space winner. These look beautiful! I really wanted to make some of these this year but I guess I will have to wait again until next year! Thanks so much for sharing at Clean and Scentsible. I will be featuring these tomorrow. Wishing you and your family a wonderful holiday season. Merry Christmas! 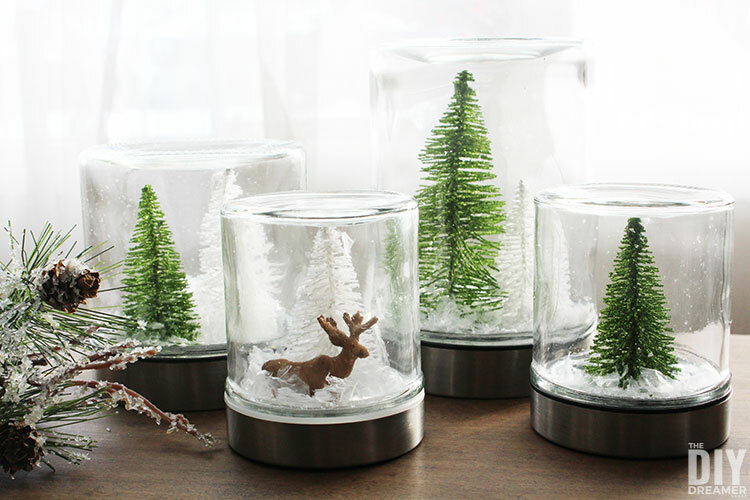 Just came from Skip to My Lou; I posted my latest project on Made by You Mondays, Mini Winter Terrariums, http://babbledabbledo.com/mini-winter-terrariums/, and thought it was hilarious that your Snow Globe post is literally the entry before mine! Gotta love terrariums/sno-globes!